AOBO 3010 -HANGZHOU AOBO TELECOM.,LTD. √ Support a maximum of 3 Gigabit Ethernet optical fibre ports, 7 Fast Ethernet electrical interfaces and Gigabit Ethernet Combo port. 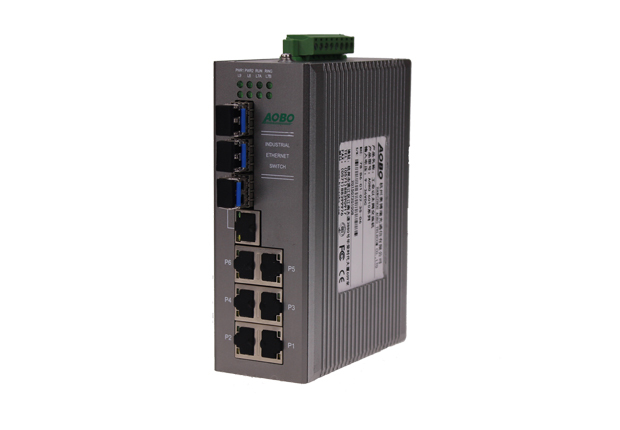 AOBO 3010 series of unmanaged rail-type Gigabit Ethernet Industrial Ethernet Switches can support a maximum of 3 Gigabit Ethernet optical ports (optional Combo interface) and 7 Fast Ethernet electrical interfaces and the users are free to select the proper quantity of the optical ports based on the demands and adapt to the different industrial scenario demands. This series of the products support 24VDC (12~36VDC) redundancy power supply with double power or 220VAC(85~264VAC) power supply. This series of switches are specially developed for the adverse industrial operating environment and adopt the solid aluminum alloy shell, fanless design and low power consumption, therefore being capable of operating stably under the industrial environment temperature of -40℃~+85℃. √ Provide a maximum of 3 SFP slots, allow the flexible selection of the different SFP modules and adapt to the different networking demands.